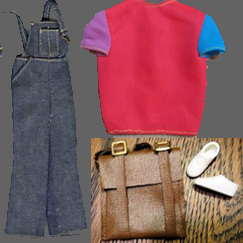 Yes, denim overalls were popular in the early 1970s, so of course Barbie had a pair!! Her's are surprisingly realistic with little gold hooks at the bib. Her red tee shirt had different color sleeves. Her brown faux leather backpack is really impressive and she finished her look with white tennis shoes. We all wore Keds back then - it was before Nike or Reebok! This ensemble is not very easy to find, but there doesn't appear to be much demand for it by collectors, either.